A fly is waiting for the morning dew to evaporate, Val Ferret, Switzerland. One of the big advantages of camping is the fact that I can get up earlier than the rest of our family, go on a photography walk for one or two hours, and then we can still have breakfast together. The Camping des Glaciers in Val Ferret is ideal in this respect (in every other aspect as well - a great campground! ), because it is located outside the village and surrounded by meadows and rivers with plenty of subjects to be discovered; especially for macro and detail photography. At the moment, the photograph above is my most preferred creation of our recent vacation (and of those taken with the GX8). 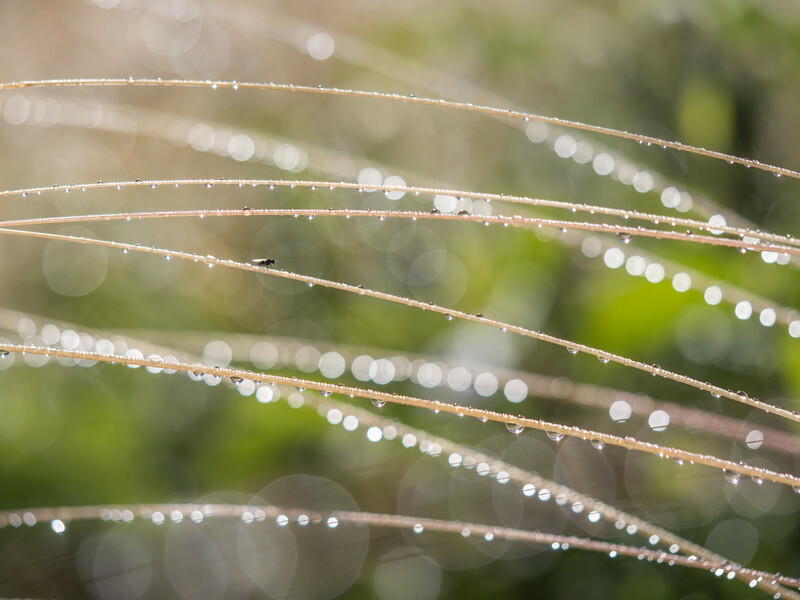 I have searched for and tried different compositions of blades of grass with drops of morning dew. It was only in the viewfinder, that I discovered the tiny fly (only a few millimeters long) that adds, in my opinion, the icing on the cake in this photograph. The camera was positioned amidst the wet grass and some of the blades were just in front of the camera, others further in the back. I really like the horizontal, regular structure, the light, and the perfectly sharp fly. This photograph is actually one of the cases where a larger display is better - it looks definitely more impressive on my computer screen. The composition has been added to my "macro gallery", where you can find different kind of close-up nature shots; some of which were taken a long time ago (I did a lot of macro photography in my youth).